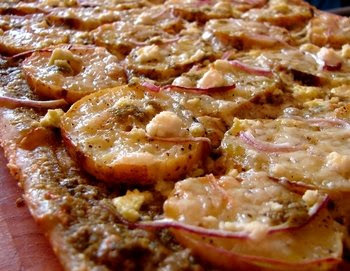 Food Wishes Video Recipes: Potato Pesto Pizza - Hot Starch-on-Starch Action! One of the cardinal sins of menu planning is putting two starches together on a plate. There are a few exceptions, like Thanksgiving stuffing and mashed potatoes, or potato and macaroni salad at the company picnic, but it's just not something that's usually done. There have been stories of crazed chefs (redundant?) that have refused a customer's request for a side of rice because they had ordered pasta. That's why I've posted the extra bonus clip below. It's from the must-see movie Big Night. I've posted it here a long time ago, but I never get tired of it, and it's fitting for today's recipe. Today's video recipe is a potato pizza with pesto, red onions, feta and much, much more. While it may sound odd on paper (or screen), it's quite delicious, and makes a good case for exceptions to the no starch-with-starch rule. Besides, it was a request from my mother-in-law, so what could I say? Enjoy! Mmmmm - Its color is green, and one of the main ingredients is potatoes. No Blarney here - this is an Irishman's ideal perfect pizza! Oh yeah, and where the heck is your Duck Ragu recipe? I wish I could afford a rag on a stick. duck ragu clip got messed up i think. you may find it on YT. or google it. Can you say YUM?! Sounds amazing! You should make that for the next recipe, that would be awesome! best ending of a movie EVER. yes, basil. I say in the video, i think. Good luck! what do you guys wear with shorts? Black socks? Wooden shoes? Mmmm I love pesto - this sounds amazing. Unless you're playing basketball, or some other sport, NO stinkin' SOCKS needed! Shorts should be worn with sandals or flip flops. Ahhh, but when you're cooking, the rules are different - gotta cover those tootsies - I think it is the (yuck!) toe jam rule. Ha! that's nothing. In Hawaii you can order spaghetti with meat sauce, accompanied by two scoops of rice, macaroni salad, and garlic bread. Other than that, looks good, like all of the other dishes you show. Thanks for all the work you put into them as they are a great source of inspiration and entertainment. Would a regular ol' russet potato work here?